Beer consumption at the famous Oktoberfest festival in Germany was underreported by 1.2 million liters last year, a recent report reveals. Wrong figures appear to have been provided for years. Last year’s report presented on the last day of the event indicated some 6.5 million liters of beer had been sold. 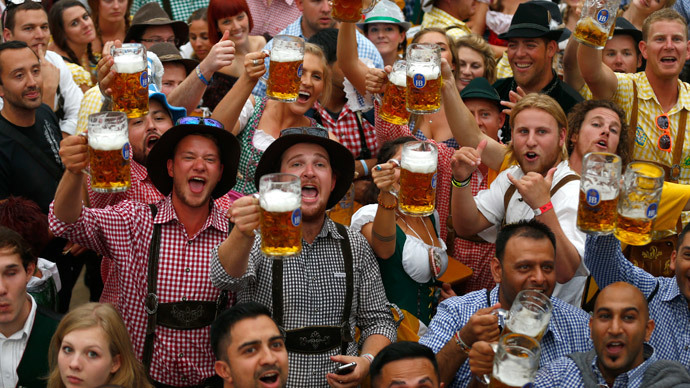 “The guests of Oktoberfest drank 6.5 million liters of beer in total,” the Zweite Bürgermeister (second mayor) Josef Schmid said. However, the daily Munich based newspaper, the Münchener Merkur, published new figures on Monday which are significantly higher. The new report says 7.7 million liters were sold during the festival, making a discrepancy of 1.2 million liters. The authorities were requested to account for the difference and explained that figures given last year were “merely an estimation by the beer sellers” and they are “not hard numbers,” the Münchener Merkur said, citing Dieter Reiter, the mayor of Munich. Beer sellers’ reps also said the difference is a “calculation error” and said they weren’t in a position to present the precise data yet. However, according to the Local, electronic accounting should make this a very fast process. The report published by the newspaper shows erroneous figures have been given for several years. In 2012, reported sales were 6.9 million liters, instead of the actual 7.4 million liters sold. Former festival chief, Gabriele Weishäupl, told the Münchner Merkur she didn’t always trust the figures presented by the sellers and sometimes had to investigate further. However, before 2011 the disparity in the figures was very low. The figures also show the rise of consumption of beer at the festival. According to the report, with only a seven-percent increase in visitors, beer consumption volumes have grown by 26 percent since 2004, from 6.1 million to 7.7 million liters. Oktoberfest is the world's largest beer festival. It has been held annually in Munich, southern Germany, since 1810. Millions of people from around the world attend the event every year, which lasts for 16 days from late September to the first weekend in October.